It has been almost thirty years ago that my wife and I first set foot on the African continent, 1983 to be precise. After a training of a couple of weeks in Burkina Faso – Upper Volta at that time, we moved to Niamey, Niger. 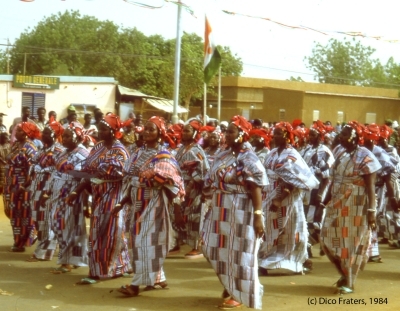 We lived and worked in the Zarma speaking southwest region of Niger for three years and learned the Zarma language, not only to be able to do our job properly but also to try to understand the people we lived among. Thanks to our Nigerien teachers, we visited special places and attended special meetings during our three year stay. We enjoyed some short stays in other countries, Benin and Togo, as well. This stay in West Africa has made an ineradicable impression. As someone once said: "If you've been bitten by the African bug, you will never ever be able to get it out of your mind." This was one of the reason I started to work out the ideas for this website and the Zarma language course in 2003. At that time hardly any information about the language and culture was available at the internet and I had language material, photos and some spare time. With this website I hope to show you some of the richness of the language, culture and music of the people living in the Songhai region of West Africa.